The Ladies Rock San Diego showcase will take place on Sunday, March 24, from 4-6 p.m. at House of Blues San Diego's Voodoo Room. The second Ladies Rock San Diego showcase is returning to House of Blues San Diego on Sunday, March 24, to benefit nonprofit organization Rock & Roll Camp for Girls. From March 22-24, female campers over the age of 18 will learn an instrument, form a band and write a song before performing in front of an audience at the camp's finale showcase. Camps will also include lessons on self-defense and meditation, in addition to jam sessions and band photoshoots. The Red Winged Blackbirds will close out the showcase, demonstrating just how hard camp graduates can rock. “We are so excited to bring back Ladies Rock San Diego for a second year! 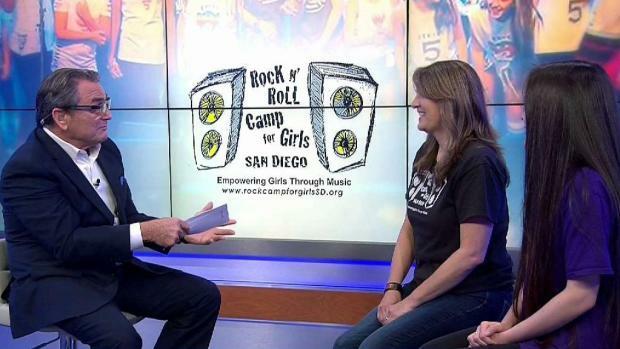 The first year was such a success that we’ve increased participants from 17 to 30 and even have participants coming from out of state to participate,” said Melissa Grove, founder and president of Ladies Rock San Diego and Rock & Roll Camp for Girls San Diego, in a recent press release. On March 24th the Ladies Rock San Diego will host their annual showcase benefitting Rock N' Roll Camp for girls. NBC 7's Whitney Southwick talks to the founder, Melissa Grove and participant, Tehya Foussat. “We’re happy that we can provide a space that encourages women to step out of their comfort zones and express themselves through music, all while having fun and supporting the girls at Rock & Roll Camp for Girls San Diego!” Grove added. The Ladies Rock camp will take place at A.R.T.S. (200 East 12th Street) in National City on Friday, March 22, from 2-9 p.m., Saturday, March 23, from 8:30 a.m.-7:30 p.m. and Sunday, March 24, from 8:30 a.m.-3 p.m.
For more information, visit www.rockcampforgirlssd.org. The Ladies Rock San Diego showcase will take place on Sunday, March 24, from 4-6 p.m. at House of Blues San Diego's Voodoo Room. Doors open at 3:30 p.m., tickets are $10 and the event is open anyone and everyone of all ages. It's the perfect daytime show to go out and support some badass women!